The reality is that the majority of people on the planet are religious. The majority of people in human history have been religious. Even most Americans are still religious, though the number is declining. Thus American students should be exposed to religion (or religions), if for no other reason than to have a functional knowledge of faith and principles such as doctrine, dogma, religious practice and spirituality. 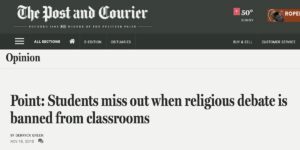 Students should understand religious influences on human ideas, thoughts, attitudes and behaviors – even if they decide not to follow any specific religion. The resulting unfamiliarity with religion has done a tremendous educational disservice to generations of schoolchildren. Separating religious instruction from school has suppressed intellectual curiosity and exploration – reinforcing ignorance about the significance of religious impact on human progress, the rise of civilizations and overall global development. In the commentary, Derryck cited a New York Times editor who acknowledged that the establishment media doesn’t “get” religion. He also provided an example of a reporter who misinterpreted the Bible. InsideSources content is read by around 25 million people a month and is syndicated to almost 300 of the top American newspapers. 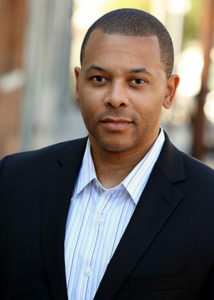 To read Derryck’s commentary in full, click here.